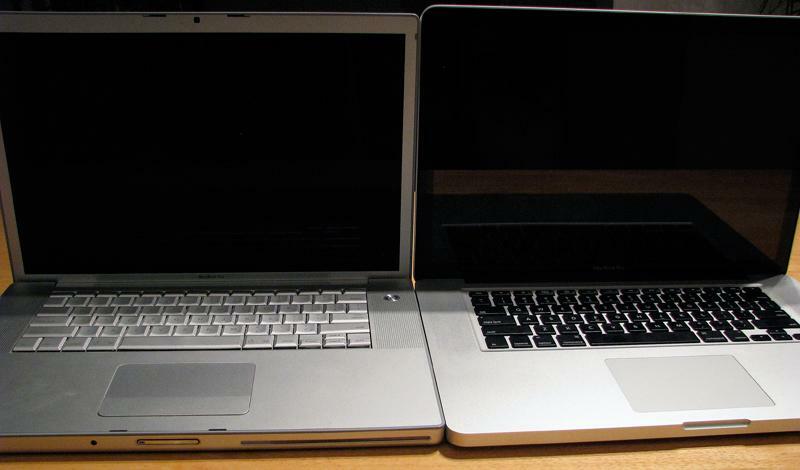 The display lid and hinge is similarly built tighter and stronger, resembling the design of the MacBook Air. It's not much (if at all) thinner than the previous model in the middle, but its sharply tapered edge gives it a much thinner feel and appearance. On previous MacBook Pros, the lid had considerable 'bounce flop' in the amount of slack it will move before the hinge catches up and adjusts to a new angle. The new model has a far more precise feel that seems to lack any slack bounce at all. The lid also opens significantly wider than the previous model, another welcomed change. The lid also acts heavier however, so if you hold the body perpendicular to the ground, the lid will fall shut by gravity. That means if you're laying in bed and hold the screen closer for examination, the lid will fall shut and smack you in the face. The previous model's lid has more resistance to closing; its open screen will stay open when held at any angle. The new lid does close with a more pleasing, smooth action (as long as your face isn't in the way), and shuts precisely with an invisible magnetic latch action that sticks the lid shut but offers no resistance when you want to open it. Previous models used physical latch mechanisms that reached down to grab ahold of the body case, and required pressing an uncomfortably thin release button to open up the display. The display's black border makes the LED-illuminated screen appear to really snap with vivid, high contrast color, but the new design also pushes the glossy glass screen right to the corners of the lid. The screen with its black margin covered by glass is identical in design to the iPhone, but because the MacBook Pro's screen area is so much larger, it can also be harder to position it so that you're not getting background glare. With the display backlighting turned off, the screen turns into a mirror. Seriously. It's far shinier than even the previous glossy notebooks Apple has shipped. While the bright screen does help cut through any glare from background light sources behind you, the shiny black margin around the screen picks them up like a mirror. The display looks phenomenal as long as you aren't positioned with your back to bright light sources, but if you're not a fan of glossy, you'll not be pleased that extreme gloss is the only option. On the other hand, Apple reports that users overwhelmingly prefer the glossy option (it knows because it previously offered both versions). Glossy not only looks more pleasing but is actually more color accurate than a flat matte screen, which diffuses light, providing a softer image. Those plusses tend to overshadow the annoyance of reflective glare. In addition to glare, the new glossy black margin also picks up fingerprints. It's easy to smudge up the margin area when adjusting the angle of the screen from the side. Once you grow weary of wiping off the smudges, you'll quickly teach yourself to grab the lid by the metal rim. While the glossy expanse of glass is easy to mark up, it's also easy to clean, as there's no abrupt edge between the screen and the frame as with earlier models; you can wipe the screen off from edge to edge. Is the new screen too glossy? Our first experience with glossy screens on PC notebooks left us thinking that high gloss was an unsophisticated gimmick. Since then, we've softened that outlook and ultimately selected a glossy screen Mac when the option became available. We've now grown accustomed to using a glossy MacBook Pro to the point where it's hard to use a matte-finished Cinema Display connected next to it; the non-glossy screen is that much less desirable to look at. The new MacBooks are now even glossier. The more shine there is on the screen, the more vivid the contrast between white and black and the brighter colors appear. At some point, we expect high gloss to reach a point where it sends us into a diabetic sugar coma, but the new MacBooks aren't there yet. Yes, there is glare, and yes it is now more distraction given the black, mirror-like frame, but even sitting in the garden window with lots of bright natural light, the new MacBook isn't really so dangerously shiny as to be unusable, although one might need to take light sources into account more, something that notebook users have always needed to do. It will be interesting to see if Apple can manage to keep things at a decent balance between distractingly shiny gloss and vivid display pop. 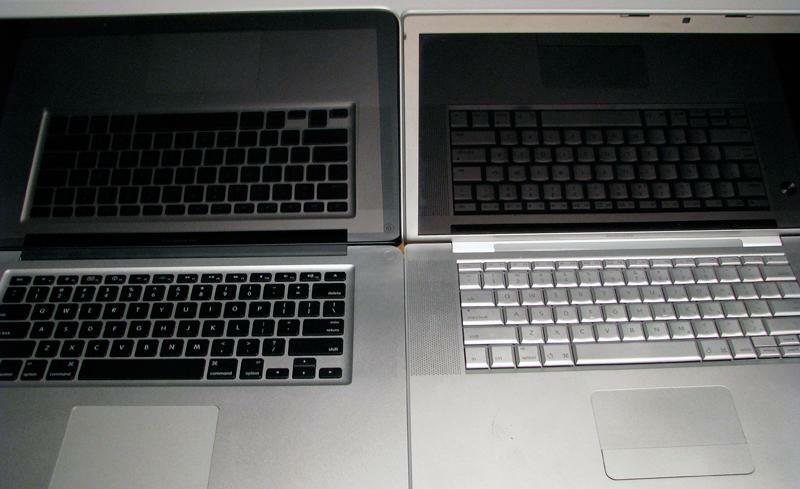 The very glossy new MacBook Pro compared to a glossy version of its predecessor. Another comparison shot from an alternative angle. Outside of the shiny black-framed display, the most apparent difference over the previous model is the new black keyboard and larger trackpad. The keyboard ties in visually with the black screen margin and hinge, creating a distinctive, high contrast look compared to the uniform aluminum color of the previous model. Whether you decide you like the black on silver appearance or not, it does seem to help disguise the fact that the new model is actually about half a finger wider and deeper than the old model. It appears that the slightly larger case is required to accommodate the same 15" screen while allowing for a thinner taper around the lid edge. Despite being bigger (and only slightly thinner), the color contrast and the unit's rounded, tapered edges make the new model feel lighter, tighter, and if anything, more compact. The flat black keyboard itself looks plasticky and cheap at first glance, compared to the silver metallic look of the old model. 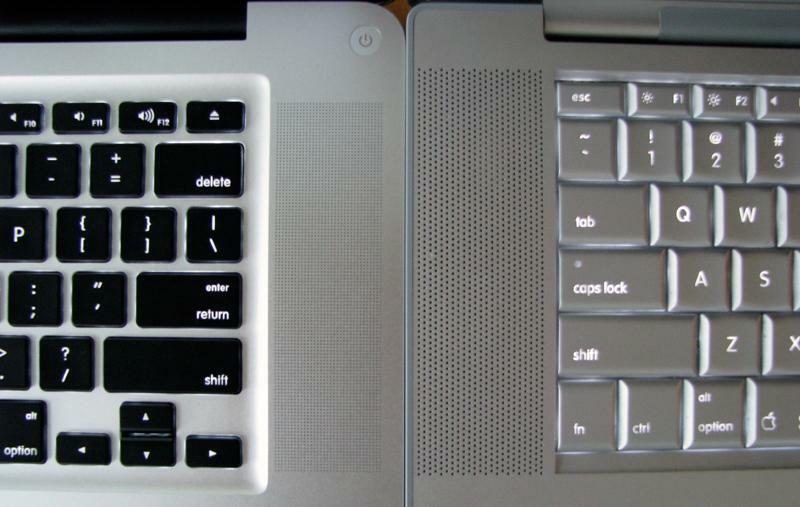 The previous notebook's keyboard was plastic too though, and the new key action isn't at all worse. The keys feel slightly lighter and more "tappy" as they make more of an audible click when typing. The previous model's keyboard actually feels mushier and soft but slightly quieter to type on, which some users might prefer. After some experience with typing on the new keyboard, it feels no better nor worse than the previous model, although there is enough of a difference for users to hold a preference. The black keys certainly help the white labels to stand out, making both the letters and the revised new F Key shortcuts (including volume and audio playback buttons, Exposé and Dashboard buttons, and screen and keyboard illumination controls) easier to identify at a glance. With illumination, the white on black keys are also more readable in dim light compared to the white on light-silver keys of the old model (below). On page 3 of 6: The glass trackpad.